Lien Vets, Founder of Noella Showroom, is one of our Brand Assembly NY show veterans and has been using BA HQ as her home base for NY markets since we first began hosting additional brands in our co-working space! Lien not only runs a successful showroom with some of our favorite brands, she's also a lover of sports and all things active, a Belgium native, and has some great skincare tips (that we of course got the low down on for you!). While in LA for our recent F/W '17 show, we swung by Noella Showroom's permanent location in the Cooper Design Space to chat with Lien. We discussed everything from professional soccer to the hardest aspects of running a showroom. Check out our interview with Lien below and let us know in the comments who you want us to feature next! TELL US ABOUT YOURSELF, HOW DID YOU GET TO THIS POINT IN YOUR CAREER? After graduating from college in Belgium, I worked, traveled, and somehow ended up in LA. After working as an analyst for an online company as my first job in LA, I landed my first real job in fashion with G-Star as a West Coast account manager. I then went on to work for Simon Showroom for 4 years before starting my own showroom. I’ve known since college that I wanted to have my own business, but I didn’t know what that would be exactly. It all kind of came together after working as a rep for many years and was a natural progression. I wouldn’t say I always knew I’d have a career in fashion. I definitely have always enjoyed fashion and have had my own style but I was very much into sports growing up, so this was my focus all the way through college. I guess my dream was essentially to become some kind of professional athlete. 😊 I did come close to this playing semi-pro soccer for eight years, but that wasn’t going to be a life plan, especially with women’s soccer in Europe. So, I had to figure out my path through college. I took the communications route with an emphasis on languages and specialized in international marketing. HOW DID GROWING UP INTERNATIONALLY CONTRIBUTE TO CHOOSING YOUR CAREER PATH? I think living in different countries definitely helped me get a broader view and understanding on a business and economic level, but also a personal level when dealing with different cultures. So, it seems I naturally gravitated toward a field and job where I’m lucky enough to get to work with interesting people from all over the world. WERE THERE ANY JOBS THAT, WHILE NOT RELATED TO FASHION, HELPED YOU FIND YOUR PATH? I’ve had so many jobs since high school it’s hard to pick one experience from them. I think all of them teach you something. What you don’t want to do when you grow up being a big one. 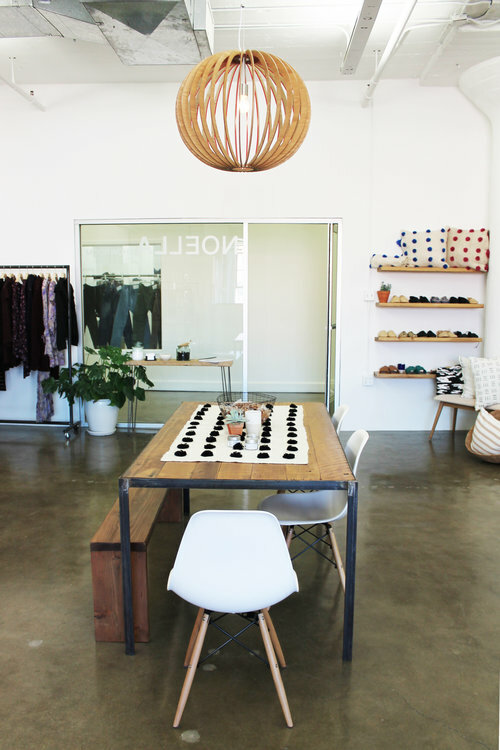 WHAT IS A TYPICAL DAY AT NOELLA SHOWROOM LIKE? A typical day starts with me communicating with my European designers as the big time difference makes it so we are all only at work together for a couple of short hours. After that, I’ll head to the showroom. I’m still completely immersed in the day to day sales aspect, so daily communication with clients and retailers is key. In the afternoon I’ll usually be on email or a phone call with our Australian brand, Flannel, as they are on the opposite spectrum of the time zone. HOW WOULD YOU DESCRIBE YOUR PERSONAL STYLE? DO YOU FEEL THE BRANDS YOU TAKE ON REFLECT YOUR TASTE? THAT BEING SAID, IS TAKING ON BRANDS MORE OF A GUT INSTINCT THING, OR AN ANALYTICAL PROCESS? I believe it’s a combination of both. I ask myself questions such as: does the market need it? Does our customer want/need it? What is the potential of this brand? Which large retailers do I see this sitting in? Is production on point? Where/how is it made? Pricing is very important as well. And, of course, loving the product. The gut instinct is there though. I’ve learned more and more to trust it and I’ve found that I’m now working with brands that have similar values and are just good people to work with. HAVE YOU EVER HAD TO PART WAYS WITH A BRAND? DO YOU HAVE ANY ADVICE ON CUTTING OFF PROFESSIONAL TIES IN A WAY THAT DOESN’T ANY BURN BRIDGES? Oh yes, I have had to part ways with brands. It’s never a fun part of the job and there have been good splits and not so good ones. The good ones are just when both parties are honest with each other that it’s not working. That’s it. There’s a mutual respect there and you wish them all the best. AS A BUSINESS OWNER WHO HAS BEEN ON MULTIPLE SIDES OF THE FASHION WORLD, HOW DO YOU DEFINE SUCCESS IN THIS INDUSTRY? That is such a hard question and I’m not sure I know how to answer this. People come from all different backgrounds and walks of life and to only look at success from a monetary or title standpoint is not correct. But how to define it - it's difficult to say. I think if you’re a genuinely nice and hard working person and you are happy, you’re on the right path. ON THAT NOTE, NOW THAT YOU CAN CROSS 'SUCCESSFUL BUSINESS OWNER' OFF YOUR LIFE, IS THERE ANYTHING ELSE YOU WANT TO TRY? I want to invent something! We are always coming up with funny inventions here in the showroom so who knows, maybe one day it will happen! BEING THE BOSS MEANS THAT WORK CAN TAKE OVER YOUR LIFE. WE KNOW THAT BEING OUTSIDE AND ACTIVE IS A BIG PART OF YOUR WORK LIFE BALANCE - HOW DOES PHYSICAL WELLNESS FACTOR INTO YOUR MENTAL WELLNESS? All I know is that I have to be active. I don’t know a life without sports or being active. And it plays a huge role in my mental state. So, I work out usually in the mornings before work. Right now, I’m either doing pilates, spin, pop physique, the stairs in my neighborhood, or a run around the lake. On weekends, I love beach volleyball, hikes, and bike rides. We are going skiing in Mammoth in a few weeks. And Iceland is on our summer holiday schedule so lots of outdoor nature time there! SINCE WE KNOW YOU'RE INTO WELLNESS AND SKINCARE WE HAVE TO ASK - WHAT'S YOUR SKINCARE ROUTINE? Haha! Well, I’m not super loyal to just one product and tend to try different things before I use the full bottle - to my husband’s frustration when he opens the bathroom cabinet. I do use vitamin C serum day and night - for seven years now. I’ve been using a moisturizer with hyaluronic acid in it now and eye cream since I was 20 or so (Thanks Mom!). For makeup, I do a high SPF tinted moisturizer, concealer stick with SPF for spots, and Bare Minerals face color to look alive. I’ve also recently been loving eyebrow stuff!